I read this article and found it very interesting, thought it might be something for you. The article is called One On-Duty Government Allopathic Doctor Serves 13,870 People and is located at https://archive.indiaspend.com/viznomics/one-on-duty-government-allopathic-doctor-serves-13870-people-36557. 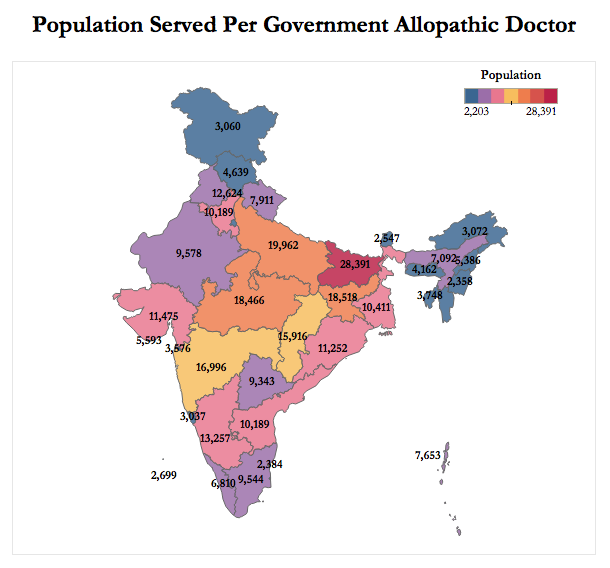 There are 113,328 government allopathic doctors in India, which means each doctor serves a population of 11, 097 on an average, according to National Health Profile, 2017. Considering that 80% of them are on duty (the view taken by a Parliamentary committee on health and family welfare), 90,662 government allopathic doctors are active; so one doctor per 13,870 people. That is about 13 times more than the World Health Organisation recommendation that there be at least one doctor per 1,000 people. Bihar has the worst government allopathic doctor-to-population ratio with each doctor serving about 28,391 people. Uttar Pradesh (19,962), Jharkhand, (18,518) and Madhya Pradesh (18,466) also have poor government allopathic doctor-to-population ratio. Manipur (2,358), Sikkim (2,540) and Goa (3,037) are among the states with the best government allopathic doctor-to-population ratio. Increasing the number of physicians by one per 1,000 population reduced infant mortality by 15% within five years and by 45% in the long-run, according to this 2009 paper by Harvard School of Public Health which studied a dataset of 99 countries between 1960 and 2000.